If you absorb only a minute fraction of what Nora's grandmother taught her about Oaxacan cookery over the course of about four decades, you'll leave with not only a fount of knowledge about ingredients and techniques, but also a profound understanding of the history and geographical variation of all that's Oaxacan cuisine today, and of course completely satiated by the end of your gourmet meal. Oaxacan Nora Valencia enraptures her students with informative stories and humorous anecdotes peppered throughout her class about her abuelita's insights into food preparation and ingredient combinations. But she also confesses, while walking from the market, that hers was a long journey in arriving at a "classroom" environment upwards of ten years ago: "What my grandmother and mother taught me wasn't nearly enough. My coming of age as an instructor required a lot of research and travel, in the nature of sociological and anthropological investigation, some chemistry and physics, and even botany. And I always tried to get my hands on as many old books as possible about Latin American foodstuffs, and wherever possible concerning Mexican and Oaxacan plants and herbs and pre-Hispanic recipes. There's one book in particular I still need, called ‘Conquista y Comida'; maybe you'll come across it at a local book fare and let me know." 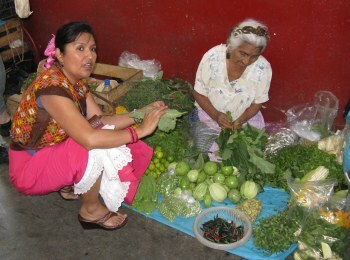 Nora imparts an understanding of the difference between produce found in the permanent market stalls (most often purchased by the vendors from growers or wholesalers with large operations), and that sold by mainly women sitting on the ground who have grown the fruits, vegetables and herbs in their own towns and villages: "We now use the term organic, for what we have traditionally referred to as criollo, which is what these ladies sell. But some of the large stalls also have criollo produce, so watch for it." Nora reveals both here and several times later on in the kitchen setting, what ingredients, more easily accessed back home, can be substituted for what she buys in the market such as local varieties of green and red tomatoes, specific herbs, chiles, and even masa: "If you can only buy packaged Maseca brand corn flour in Oregon, and you're making tamales, then add a bit of cornmeal to give it the proper texture. Feel the difference between the two types of masa we find here in the market, one for tortillas and the other for tamales. And you may already know, we use a lot a hoja santa in our recipes, and it's only available in some states, such as Florida, so if you can't find it, try using ..."
Rather than purchase everything at this market visit, Nora has already purchased most the day before, and what she does buy during this brief tour she leaves at each stall and picks up when we're ready to depart. "Now I'm going back to some of the puestos to pick up what we bought, so let's meet out front in 10 – 15 minutes. Meanwhile you can go and buy some of those rarer dried chiles to take home, that spicy paste that I told you I like to keep in my purse when visiting the U.S., and maybe even some gusano worms that we'll be using to make a salsa later on. You can buy a string of 100 and wear it as a necklace for customs." Nora passes on invaluable advice about which ingredients you should be able to take over the border, and what freezes well (i.e. quesillo and chapulines --- Oaxacan string cheese and grasshoppers). We walk to her nearby home on a quaint cobblestone road, where the balance of the class will unfold. 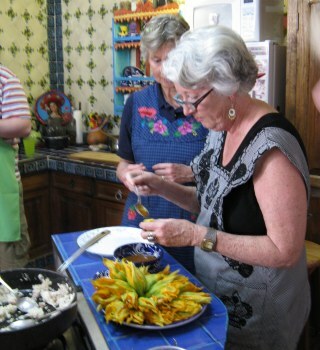 We'll spend the rest of the morning and afternoon in her traditional, painted-tile (talavera) kitchen with center island, and her dining and sitting rooms opening onto a courtyard lushly landscaped with trees, vines and flowering shrubs. A feeling of comfort envelopes, like you're at home, because in a sense you are, made to feel as welcomed as possible. With only one assistant, Minerva, I marvel at the intense work that has gone into the pre-preparation of some dishes, and more importantly how Nora must be "on" 100% of the time, and attentive to each of the ten apprentices, ranging in age from early twenties to late sixties, for upwards of six hours. It's effectively all Nora, teaching, directing, reassuring, reminding, and correcting. With mainly novices in this class this day, making dessert tamales, one of the two most complex recipes of the day, isn't as easy as simply mixing up some dough with pineapple chunks and wrapping it in corn husk. Three mixtures are prepared, placed into the husks, and then folded in a most gingerly fashion: "Sorry, but this will have to be another patchwork, so we'll combine two into one, or better yet, how about just using an extra husk to hold it all together." There's the masa mixture, the coconut / milk concoction, pineapple / sugar / cinnamon fusion, plus raisins to boot. "Now see that I'm not spilling out the water from boiling the pineapple, because I can use it another time instead of just water, to make a fresh fruit juice (agua fresca). It's already sweet and flavorful." Where a component has been prepared prior to our arrival, Nora instructs how it's been made, such as with the chicken and beef stocks. When there are optional ingredients, Nora not only tells us what we can substitute based on personal preferences, but also explains regional variations. And while we're preparing mole amarillo, she educates a propos the fallacy of there being seven moles: "Some think of siete moles because we at times refer to seven regions in the state. But if you stop and consider, in Puerto Escondido for example, where shrimp are often used to create stock and as the protein in amarillo, shouldn't we consider this mole a class or variety onto itself?" As we're preparing our mole amarillo, we're tasting as the flavor subtly changes, adding hoja santa, the spice mixture, the masa which, it's explained, absorbs and reduces some of the heat. A fiery salsa is almost magically converted into a complex mole, a creation one is hard-pressed to encounter when commercially prepared. "How spicy does everyone like to eat? You know I don't promise anything because peppers are like lottery tickets: you never know. I used to say to my grandmother, let me measure, but she would say no, use your eyes, your nose, and your mouth to measure." Nora continues that the same ingredient is often different in intensity, flavor, and how it absorbs, as for example with chicken … it's not always the same. Printed recipe sheets are distributed, but not until the meal has been served. Nora opines that it's better for students to first watch, listen, participate, and ask questions, rather than read and make notes. As the meal concludes, she then reviews the recipes and fields questions regarding any doubts. Dessert tamales with pineapple, coconut and raisin. Even Nora's grandmother would be hard-pressed to produce such a diverse, delectable and complete comida. Alvin Starkman together with wife Arlene operates Casa Machaya Bed & Breakfast. Alvin received his masters in social anthropology in 1978, and his law degree in 1984. Thereafter he was a litigator in Toronto until taking early retirement. He and his family were frequent visitors to Oaxaca between 1991 and when they became permanent residents in 2004. 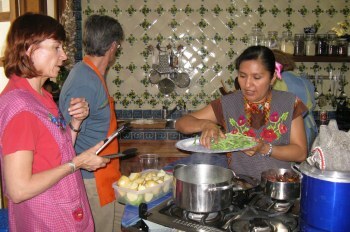 Alvin reviews restaurants, writes about life and cultural traditions in Oaxaca, and tours couples and families to the craft villages, towns on their market days, ruins, and other sights in and around the central valleys of the state capital.